The reality, when you talk about how to motivate employees, is that they're already motivated. As a manager, you're charged with figuring out how to tap into that motivation to accomplish work goals. Fortunately, you control the key environmental factors that are necessary to achieve this. The most significant factor under your control is your relationship with each employee. The second-most important factor is a work environment and organizational culture that foster employee motivation and engagement. Ideally, the work culture consists of an environment in which employees are trusted, treated like the adults they are, and not micromanaged. Employees are entrusted with the values, vision, mission, and strategic framework within which they're expected to do their jobs. They receive frequent communication, are regarded with respect and civility, and have input to every facet of the work they're hired to produce. They're also encouraged to speak up about what they believe when participating in solving a problem for a customer. And the organization trusts them with its most significant and critical financial information so they're not blindsided by business problems. These are factors that help produce a work environment in which employees choose to be motivated to accomplish the requirements of their work. Nothing is more powerful than a group of contributing, motivated employees. No workplace will ever give managers the perfect work environment and culture to support their efforts toward fostering employee motivation. But you can create an environment that motivates your employees and increases their level of satisfaction by taking seven key steps, such as providing them with opportunities to grow their knowledge and skills and giving them all the information they need to do their jobs effectively. The most important emotion that employees bring to work is motivation, according to Jon Gordon, author of Soup: A Recipe to Nourish Your Team and Culture. Although some managers want to zap emotion from the workplace altogether, Gordon argues that this is a mistake and shares his wisdom on how to plug into your employees' inherent motivation during challenging times by cultivating your relationships with them, creating a climate of trust, expecting only the best from your team, and more. Increase workplace motivation and morale by understanding that as your employees' manager, you're their passport to a boom or bust day. Words matter, but there's much more you can do to help employees get a handle on motivation and high morale, including setting high standards and clear expectations, focusing on their personal and professional development, and starting every day with a smile and a luminous attitude. It's All About the Managers...Duh! David Maister, best-selling author, expert on the management of professional services firms, and former Harvard Business School professor, gives you a window into his insights on how managers can catalyze employee motivation. First and foremost, behave as if you're a part of the team by lending a hand with the work, making yourself available to anyone who has a personal or work-related problem, and actively helping your people to achieve their goals. Expand your motivational toolkit with six leadership actions you can take to promote trust and feelings of security in the workplace while minimizing anxieties, hostilities, and cynicism. Start by communicating honestly and frequently with each employee in your group, really getting to know your employees (and letting them get to know you), and infusing your team with your own optimism and vision. Make progress toward creating a work environment in which employees choose to be positive, enthusiastic, and motivated. Strategies for achieving this type of environment include treating employees with respect, recognizing their contributions to the team, providing unambiguous direction, responding quickly to complaints and requests for help or feedback, and asking them to tell you what motivates them if nothing else seems to work. Understand that motivation is basically a person's own drive to achieve something, like winning an award or completing a project. As such, your employees don't need you to motivate them but rather to set the stage by empowering them to motivate themselves. If you get this, you'll be in a better position to structure the work environment to engage, excite, incentivize, and retain your employees. The most common response to questions concerning what employees want from their workplace on a daily basis involves their need to be treated with dignity and respect. 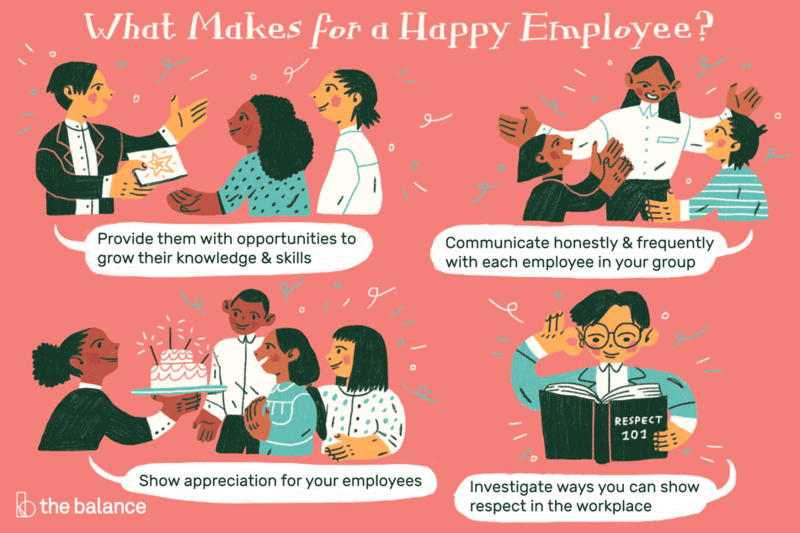 Investigate some of the ways you can show respect in the workplace—from watching your tone of voice and body language to delegating meaningful assignments to treating everyone with courtesy and kindness and encouraging the free expression of opinions and ideas. Show your employees that you appreciate them for who they are in a variety of ways, in addition to valuing their contributions to the organization. Suggestions include asking them about their interests and activities outside the workplace, bringing in the occasional bag of bagels or donuts for the team to share, or taking them to lunch on a birthday or other special day. Establish unequivocal, objective employee recognition criteria and communicate them to all employees to head off confusion, hurt feelings, and sapped morale. This means spelling out exactly the deliverables or behaviors employees will be recognized for and how they'll be recognized. It also means recognizing every employee who meets the criteria. Motivation Is All About the Managers' Performance...Duh! Know the Most Important Secret of Workplace Motivation?